The other day, a random person I met in a bar asked me if I knew the difference between conjuring and magic. I confessed that I thought they were the same thing. According to my acquaintance, conjuring is the invention of an illusion. Magic is the performance of that illusion. I can't find any evidence from a quick look at a few online dictionaries to back up this distinction, but it's an interesting one at any rate. 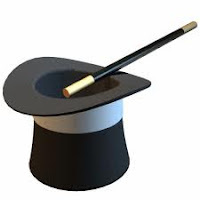 Many magicians perform tricks that were invented hundreds of years ago by known and now-anonynous masters of illusion. The difference in the two terms -- if indeed it's accurate -- explicitly acknowledges that illusions of all kinds often come from long traditions. Unlike a rabbit popping up from a hat, these tricks don't come from out of nowhere. Sometimes we forget that fact when we're sitting in the theatre or nightclub, baffled by how the wizard standing before us managed to pull the stunt we just witnessed.